I have been in Portofino many times in my 12 years as a private chef. It was my first destination on board a superyacht and I still love it. It is tiny, but breathtakingly beautiful. It is also eye-wateringly expensive. The chef in me gets a bit snobby because I always feel the food offered in most restaurants is average, but l guess it's about the whole experience. 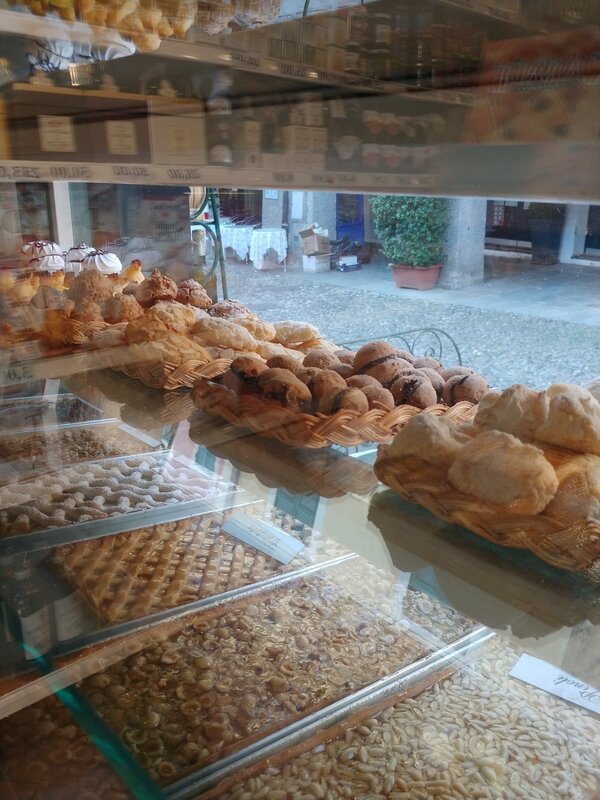 Also, average food in Italy is still pretty nice by any standards. My current employer loves the trofie pasta witch is typical of this region of Italy. I usually have to go to a special shop and by loads of it. It is tricky provisioning in Portofino since it is so small, so you want to make sure you are well stocked for the period you spend there. The yacht is always full with guests when we come to Portofino, which means you need to be well organized too. Shopping of any description is mostly a high end experience in Portofino and shopping for food is no exception. 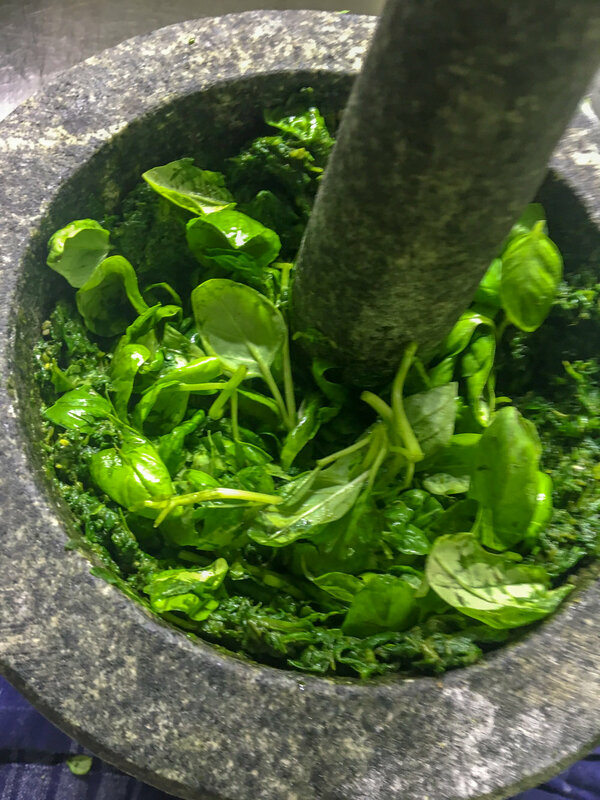 Below is a few photos of Portofino and me running around buying expensive, luxury ingredients. Down there are the yachts, up here are a few shops. I told you, it is tiny. 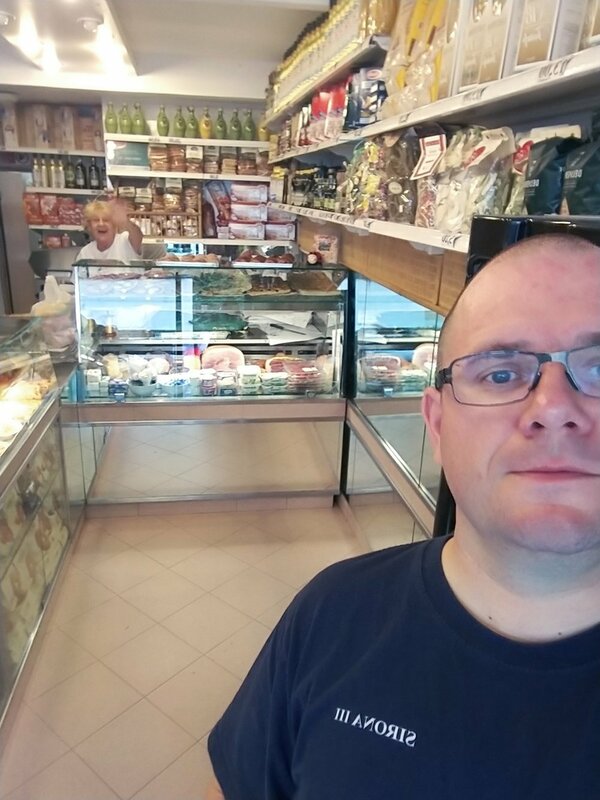 This little shop sells fresh foccacia, pastries, oils and tinned fish. Just a luxury shop with a bakery added on. It is an unusual combination, but fantastic. This lady sells fruit and veg with her husband. She is on the phone here organizing me some fish from Santa Margherita. I bought quite a bit of produce from them and they kindly drove me back to the yacht. I never say no to the crazy experience that is a car ride in Italy! This is the husband. I have known this lovely couple for 12 years. As I have mentioned, chefs don't have much choice to provision in Portofino and we normally get stocked up before arriving. However, if you find yourself in a bind - because we all know that that kind of stuff can happen - this is the guy whose number you want in your contacts. Another perk of being in a small port! This summer, during the few days the yacht was in the marina, a friend of mine named Fernando Pensato came by the yacht to say hello and give me a bit of his family brand's caviar to try. He also sells olive and vinegars. Here is a link to his website. His olive oil is really lovely and certainly one of the best I have used. Frenando is the same age as me and a lot more fashionable than me. He also gave me some extra virgin olive oil with lemon and his own white balsamic vinegar. I had time to have a drink with Fernando and his girlfriend. You should never wear your chef jacket outside the kitchen / galley no matter how cool it looks. Give that one a try. So, come to Portofino, it is magnificent. 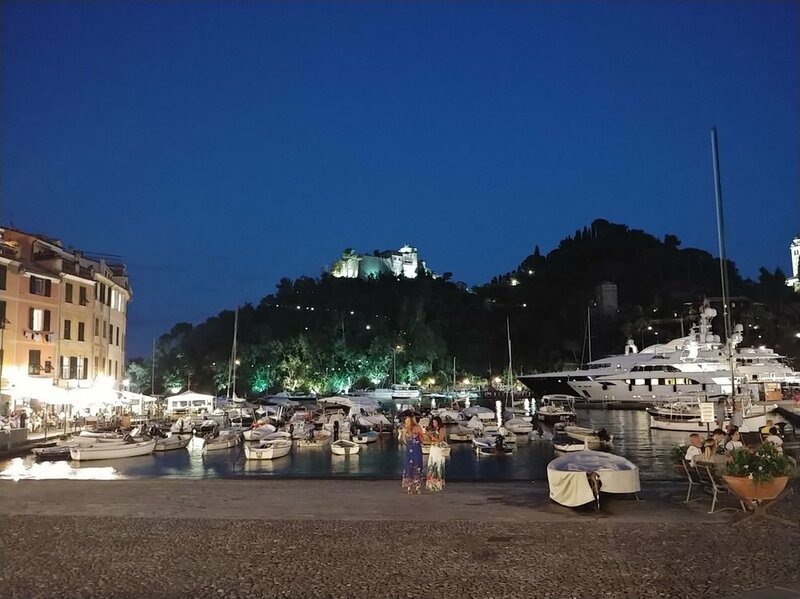 Probably stay in Santa Margherita, the coastal walk of about 30 minutes to Portofino is breathtaking. Air BNB properties in Santa Margherita are a reasonable average of $200 per night for a two bedder. It's a little bit bigger, and little less glamourus, but probably a nicer place to spend a few days. Please see my youtube video of our family holiday in Santa Margherita. It was fun. 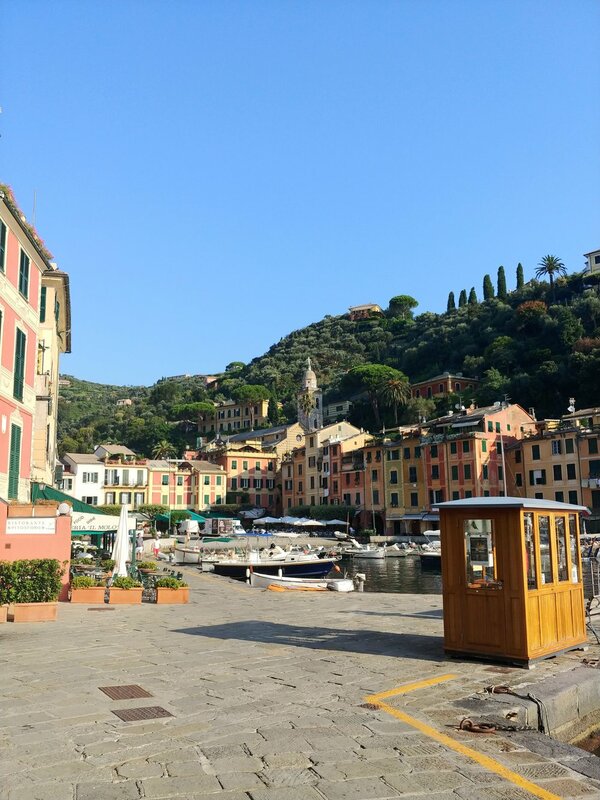 Thanks for reading, below are some random photos of Portofino and Santa Margherita. One more thing. Here are some links to some drone shoots I have made in the last couple of years.